Earthworks and construction activities disturb soils and create dust and debris. Runoff from landscape construction sites often flows into street gutters and then through drains to creeks or channels ending in rivers, bays or the ocean. If a site is poorly managed, stormwater runoff will carry soil particles, sediment, dissolved plant nutrients, organic matter and waste, which can block council drains, silt up waterways and kill wildlife. STAR Water Solutions operates an Erosion Control Application (ERA) Program to demonstrate the benefits of recycled organic materials for the erosion control of sites such as development sites, quarries, mine sites, power facilities and degraded agricultural land. 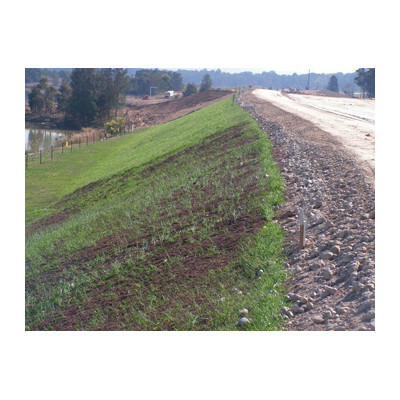 Within the ERA, STAR Water Solutions offers a service to link appropriate sites with available organic materials for erosion control to be provided at low cost. It also monitors the stockpiling and use of the materials and provides soil development advice and testing services so that best practice case studies can be developed showing the benefits of organic materials to consultants, governments and industries.